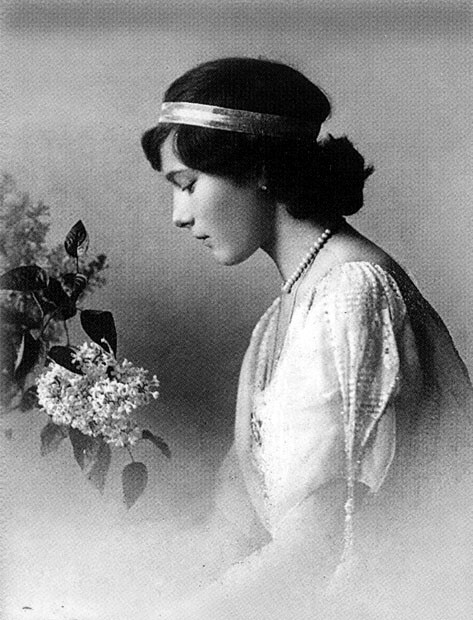 Today is the birthday of Grand Duchess Tatiana Nikolaevna Romanova. She was the second of four daughters of the last tsar of Russia, Nicholas II, and his wife tsaritsa Alexandra. Her middle name Nikolaevna means daughter of Nicholas. N.B. In the Julian calender (which they applied in Russia at that time), she was born May 29th. Many courtiers considered her the most beautiful of the Tsar's daughters. Because of her length she was considered to be the leader of the four sisters. Therefore she was nicknamed 'The Governess' and entrusted with the task of speaking on their behalf to their parents. After the outbreak of World War I Tatiana became a Red Cross nurse at a military hospital. She fell in love with Dmitri Malama, an officer in the Russian Cavalry. She had first met him when he was wounded in 1914. Malama gave Tatiana a French bulldog, she took the pet to Ekaterinburg, where it died with the rest of the family. Tatiana was only 21 when she was murdered, along with her family, on July 17, 1918, at the Ipatiev House in Yekaterinburg. COSTUMES CONTESTS AND BALLS AT THE WINTER PALACE! Good luck with that (don't become anorexic though).